“Oh, give me a home where the Buffalo roam, Where the Deer and the Antelope play; Where seldom is heard a discouraging word, And the sky is not cloudy all day” (Lomax, John A. “Home On The Range.” 1910). Just like the song, this burger is sure to brighten your day. There is something about this ”Home on the Range” burger that just makes you happy when you eat it. It might be the bright yellow yolk of the egg that when broke provides an even greater richness to this burger or it might be high its concentrations of selenium, a natural trace mineral, that acts as a mood elevator. Either way, this is a way to create your own “happy meal” at home on your range. Combine chipotles, adobo sauce, and mayonnaise in a food processor and puree. Season with pepper, to taste. 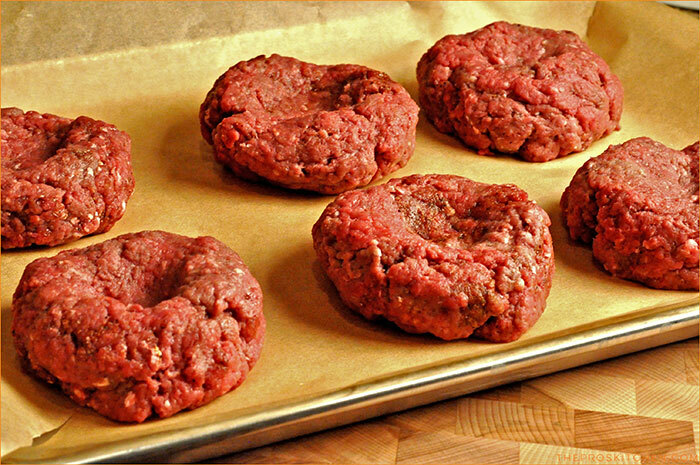 Place chipotle mayonnaise in small bowl and place in refrigerator until ready to assemble burgers. Preheat the oven to 375 °F. 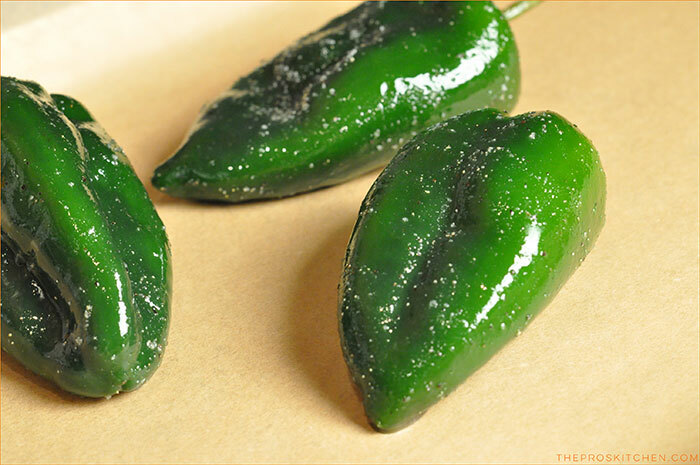 Put the chile peppers on a rimmed baking sheet; rub with 1 tablespoon of avocado oil, and season with salt and ¼ teaspoon pepper. Roast in the oven until the skin of the peppers is blackened, about 15 minutes. 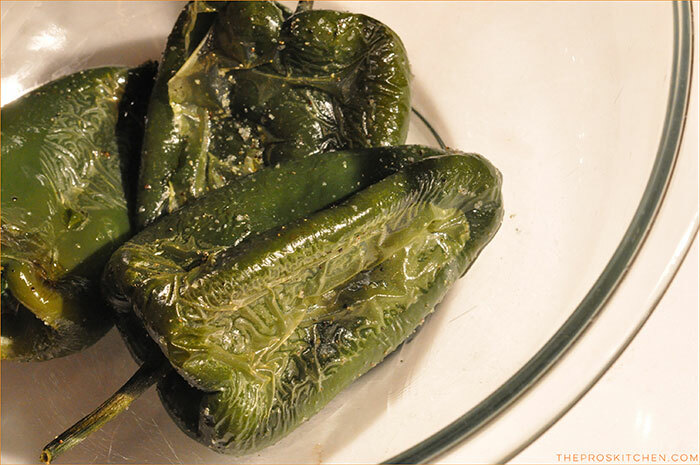 Remove the chile peppers from the oven, place in a bowl, cover with plastic wrap, and let the peppers steam for 15 minutes. Peel, stem, and seed the peppers and then cut into large strips. Place ground meat in large mixing bowl. Add southwestern seasoning blend, smoked salt, and ½ teaspoon pepper. With your hand, mix gently, being sure not to overwork the meat. Divide the meat into 6 equal portions. Form each portion loosely into a 3/4-inch-thick burger and make a deep depression in the center with your thumb. In a cast iron pan, add butter and cook the burgers to desired doneness. Wipe the skillet clean with a paper towel and add 2 tablespoons of avocado oil to the pan and return it to the stove set over high heat. 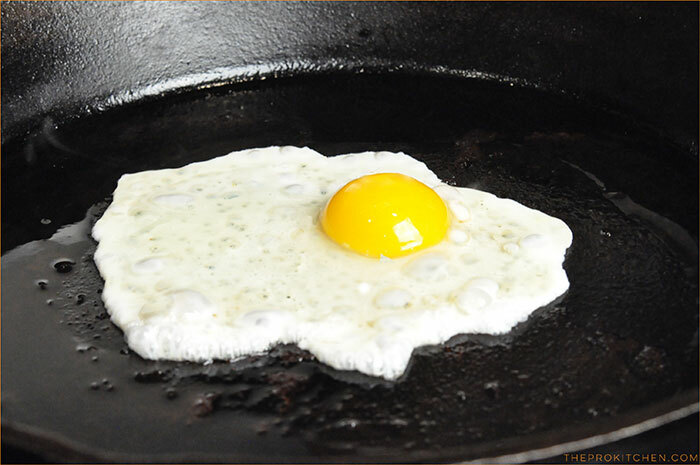 Crack an egg into the skillet, sprinkle it with a pinch of salt and immediately cover the pan with a lid. Cook until the egg white is cooked through and the yolk is barely set. Spread the chipotle mayonnaise on both the top and bottom of your choice bun. 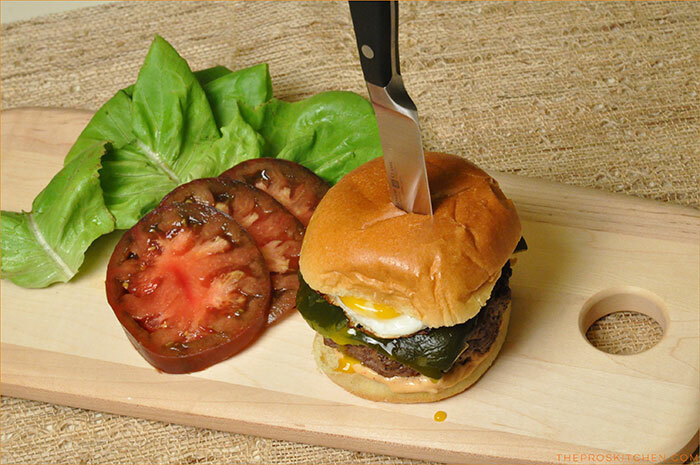 Begin to build your burgers by placing one meat patty on each bun bottom and top with a stripe of roasted poblano pepper and a fried egg. Cover with the bun tops and serve immediately. Substitutions: If you cannot find a southwestern seasoning blend substitute it with a mesquite seasoning blend. Additions: Add tender butter lettuce and organic heirloom tomatoes to your burger to add some freshness. Bison is a high quality meat protein. 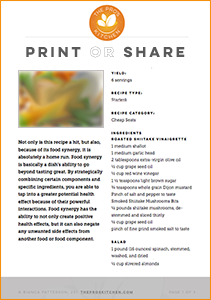 It is a highly nutrient dense food because of the proportion of protein, fat, minerals, and fatty acids to its caloric value. In comparison to other meat sources, bison has been found to have a higher concentration of iron along with other essential fatty acids – so it makes it a great option for those who might be anemic. Grass-fed bison has been found to have as many Omega-3s per serving as salmon. It also has three to six times the amount of omega-3s compared to other grain fed animals; and four times the amount of vitamin E as compared to grain fed beef. All these fun facts give you just another reason to eat grass fed. Bison also contains the highest-known levels of the fat-blocker and anti-carcinogen, CLA (conjugated linoleic acid). Research on CLA is showing evidence that CLA has the potential to reduce the risk of cancer, obesity, diabetes, and a number of immune disorders. It is also a rich source of the vitamin beta-carotene, a vital antioxidant which reduces the risk of cancer by preventing cell degeneration.